More than seven decades since the atomic bomb was dropped on Hiroshima, people are still trying to cope with its legacy and health consequences, the Japanese ambassador to Ireland, Mari Miyoshi, said at a commemoration event in Dublin on Saturday. 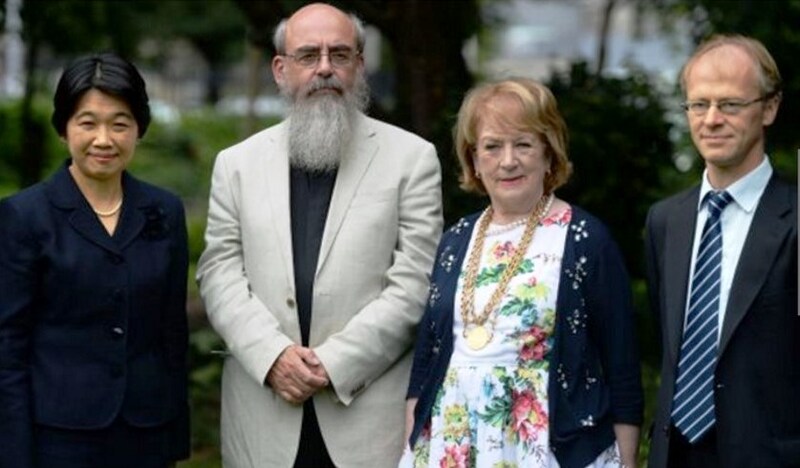 Ms Miyoshi was the main speaker at an annual anniversary event in Merrion Square, which has been held every year since 1980 and is seen as an exemplar of Ireland’s staunch opposition to nuclear weapons. “Seventy-one years ago in Hiroshima city a single bomb took more than 140,000 lives,” she told the modest gathering by the park’s memorial cherry tree. “Three days later a second atomic bomb was also dropped on Nagasaki city, and 80,000 lives instantly and indiscriminately. On August 6th, 1945, the US dropped the atomic bomb “Little Boy” on Hiroshima in a bid to bring a conclusion to the second World War. This was followed on August 9th by the “Fat Man” plutonium bomb dropped on Nagasaki. Saturday’s event was organised by the Irish Campaign for Nuclear Disarmament (CND), whose president, the Rev Canon Patrick Comerford, excoriated those willing to deploy nuclear weapons. While honing focussing on the perceived threat from Donald Trump, he also criticised British prime minister Theresa May for supporting the renewal of the Trident programme.